Institutionalized discrimination refers to discrimination embedded in the procedures, policies or objectives of large organizations. Usually institutional bias targets specific, easily stereotyped and generalizable attributes of individuals, such as race and gender. Institutionalized discrimination often exists within governments, though it can also occur in any other type of social institution including religion, education and marriage. The achievement gap in education is an example of institutionalized discrimination. Many countries around the world practice some form of institutionalized discrimination. For example, in some countries women cannot vote, drive or work certain jobs. institutionalized discrimination: The unfair, indirect methods of treatment of individuals that are embedded in the operating procedures, policies, laws or objectives of large organizations. Institutionalized discrimination refers to the unfair, indirect treatment of certain members within a group. These practices are embedded in the operating procedures, policies, laws, or objectives of large organizations, such as governments and corporations, financial institutions, public institutions and other large entities. Usually the bias targets specific, easily stereotyped and generalizable attributes, such as race, gender, nationality, sexual orientation and age. Though direct discrimination is illegal by United States law, many academics, activists, and advocacy organizations assert that indirect discrimination is still pervasive in many social institutions and daily social practices. Examples of institutionalized discrimination include laws and decisions that reflect racism, such as the 1896 Plessy vs. Ferguson U.S. Supreme Court case, which ruled in favor of “separate but equal” public facilities between African Americans and non African Americans. This ruling was later rescinded in 1954 by the Brown vs. Board of Education Supreme Court decision. Institutionalized discrimination often exists within governments, though it can also occur in any other type of social institution, including religion, education and marriage. For example, residential segregation is a product of discrimination that exists in the private real estate market. Housing in the United States can be valued differently based on the racial makeup of the neighborhood. There can be two identical houses, in terms of factors like amenities and size, but the value of each house can depend on the racial makeup of the people within the community. Homeowners would therefore have an incentive to prevent minorities from moving into white neighborhoods. Institutionalized discrimination within the housing market also includes practices like redlining and mortgage discrimination. The achievement gap in education is another example of institutionalized discrimination. The achievement gap refers to the observed disparity in educational measures between the performance of groups of students, especially groups defined by gender, race/ethnicity and socioeconomic status. This disparity include standardized test scores, grade point average, dropout rates and college enrollment and/or completion rates. Many countries around the world exhibit some form of institutionalized discrimination, such as Saudi Arabia where women and other oppressed groups cannot participate in some religious activities, and can neither vote nor work in government. 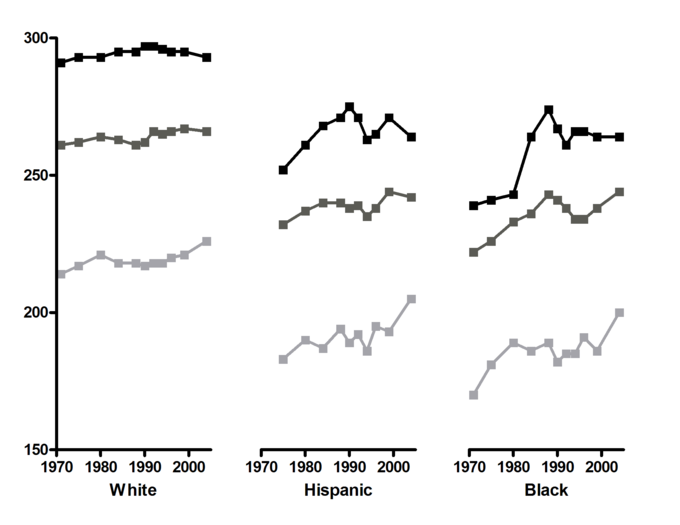 Trends in reading scores divided by race. : These figures show a long-term disparity in reading scores.